Submitted by JoeKeresztury on Sun, 10/01/2017 - 05:27. 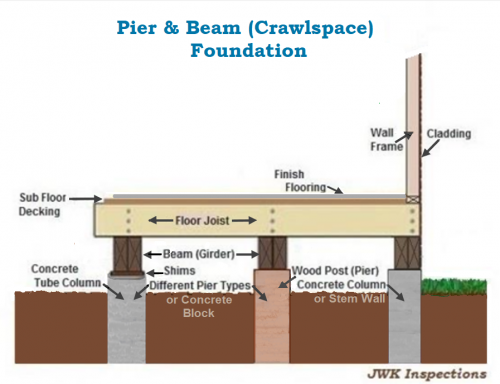 The illustration above shows proper drainage slope and clearances around the foundation that is needed as per modern standards and minimal IRC requirements. 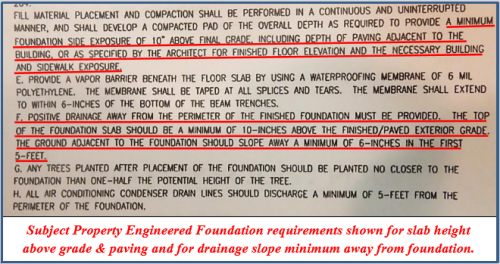 Proper drainage slope based on the International Residential Code is a minimum fall (slope) of 6" away from the foundation for the 1st 10'. 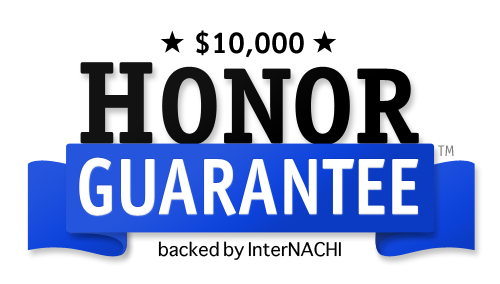 Proper clearance above grade to the top of foundation / bottom of exterior cladding is a minimum 4" for masonry areas with a minimum 6" clearance above grade at siding areas. 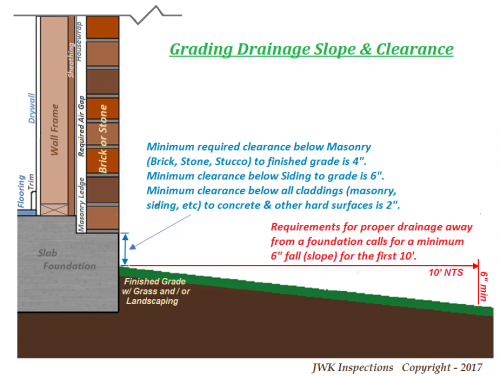 Proper drainage slope away from a foundation is not just required but needed to help prevent unneeded settling issues to the foundation of a building that can affect the entire structure over time. The International Residentional Code (IRC) & San Antonio City Code requirements call for proper drainage away from your foundation. 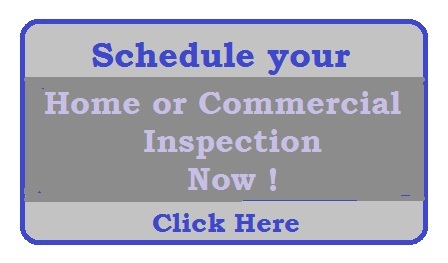 Whether the construction is in a cities jurisdiction or not the IRC dictates building codes. 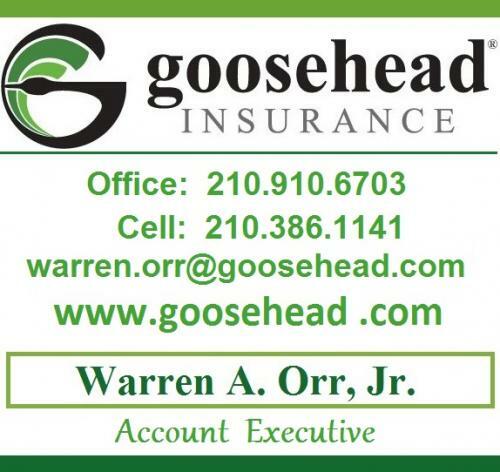 City codes whether it's for San Antonio, Boerne, Fair Oaks, Garden Ridge, Schertz, etc are based on the International Residential Code (IRC). 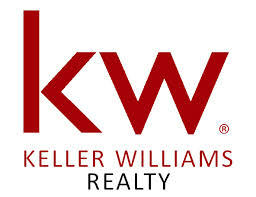 But if your not in one of those type AHJ (Authority Having Jurisdiction) areas but out in the county without city (AHJ) review of construction, your builder still has to go by the International Residential Code (the governing body for construction) and also the requirements of the engineers that design the foundation for a new home or any other type building. Engineers will at least require the IRC's minimum but some engineers I've seen even require twice the minimum code based on the IRC. 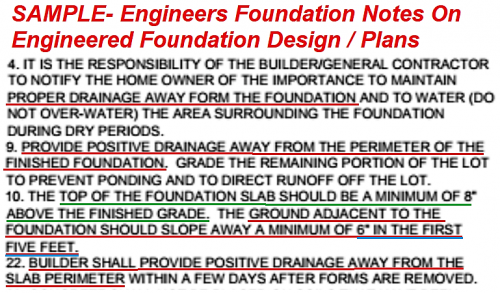 Proper drainage slope is always a requirement for certification of the foundation that the original engineer for the structures foundation had designed on a new home or commercial property construction. 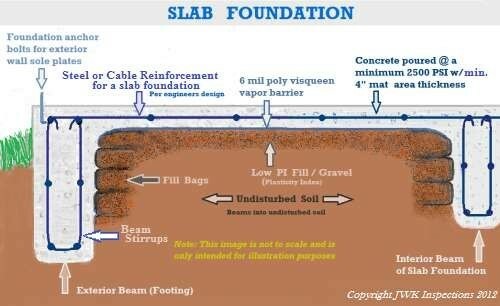 Engineers will design a foundation, inspect it before concrete pour & provide certification after approval based on their design & requirements of the foundation. 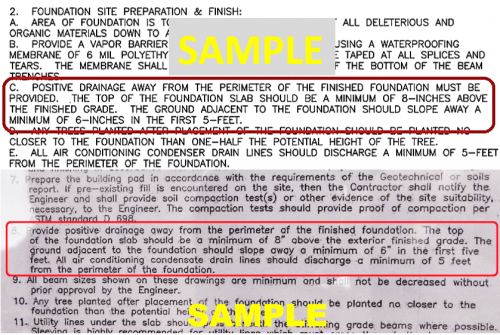 Images below are from actual engineered foundation plans for builders shown from construction phase- Foundation (pre pour) inspections performed by JWK Inspections that show that the foundation design by those engineers at a minimum require the IRC's (International Residential Code) requirement for proper drainage but also that some engineers require twice as much of the minimum IRC requirements for the proper drainage away from the foundation and the clearance of foundation above grade. 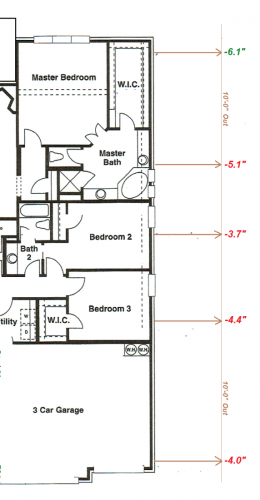 Please excuse the quality of some of the images shown below- some of them were photos taken of the engineers requirements on their foundation plans for the builder at the time of an inspection. 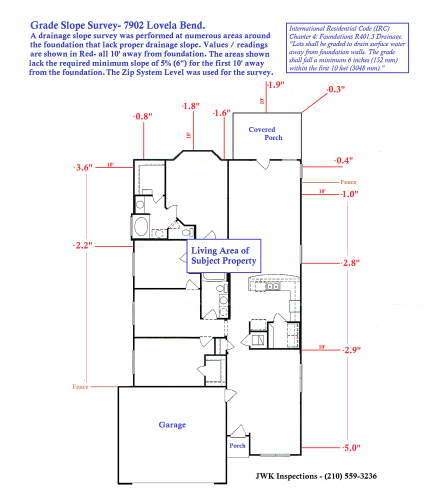 from taking photos of the engineers foundation plan. 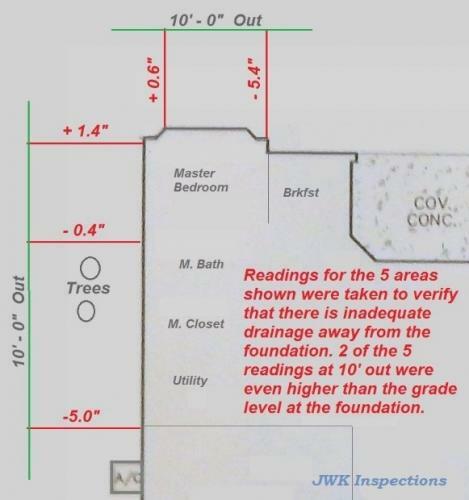 Another Builder at a New Home Pre Move In Inspection refused to let us (JWK Inspections) and the client to see the engineers foundation plans after we called out how inadequate the drainage slope around the foundation was. also needs to be established right away, within days after the concrete is poured and forms are removed. 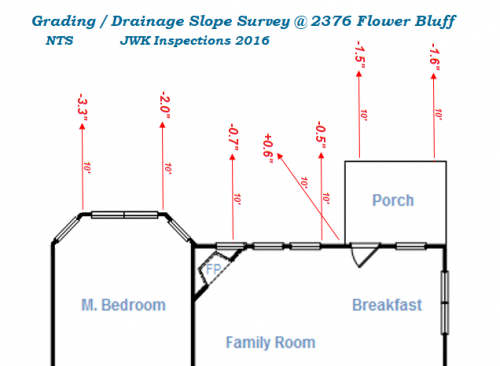 The illustration below shows a Drainage / Grade Level Survey performed by JWK Inspections at a San Antonio area home inspection with the Zip Level System. 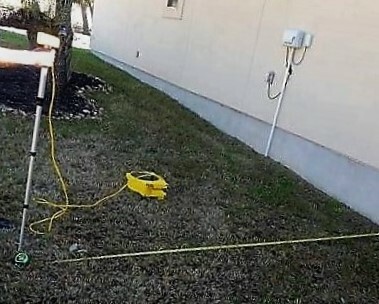 All the readings were taken at 10' away from the foundation. 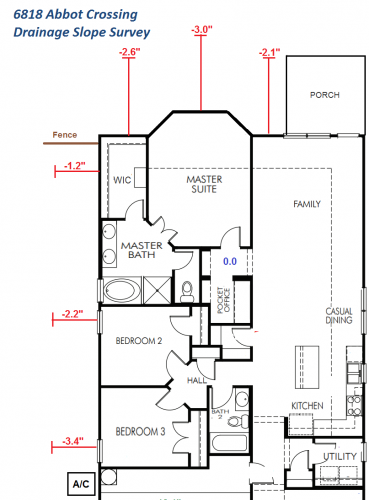 Requirements call for a minimum 6" fall, slope for that 1st 10' away from the foundation. 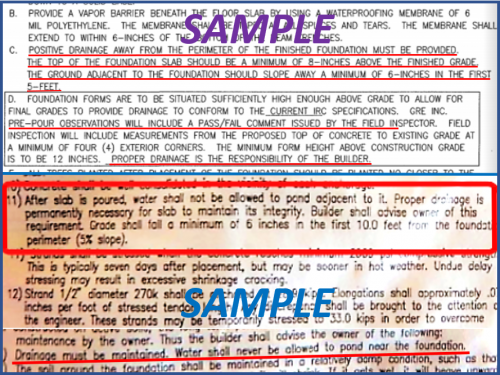 As seen in the illustration none of the areas met minimum requirements as shown with the documented readings. The red numbers show the inadequate slope in decimal inches. For instance the back left corner has less than an inch slope (fall) with only a 0.8" reading. 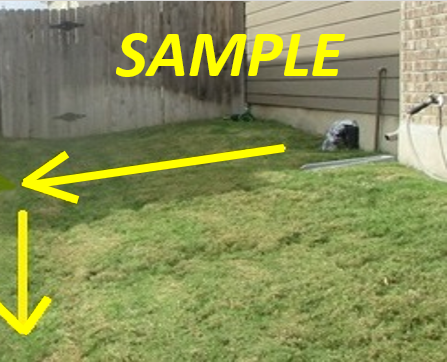 The Drainage Level Survey example below shows the Illustration (left) from the inspection of a home in the San Antonio area & for this article we also show the Process of doing the Drainage Survey Part of the Inspection with the Zip Level System. 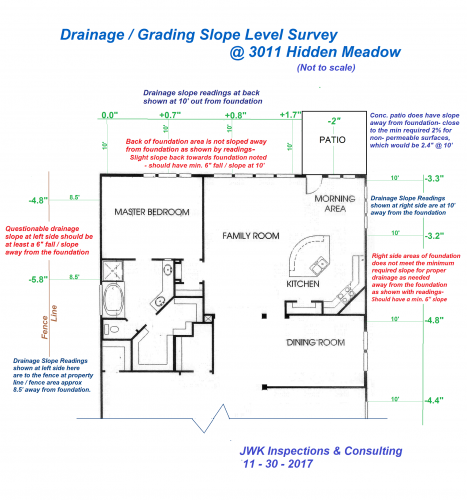 Drainage Slope Level Surveys can be done for a property whether it is in conjunction with an inspection for the entire property (as with this property) or just to evealuate the drainage around any type foundation. Above left- A drainage slope survey showing inadequate drainage slope away from the foundation in areas shown. 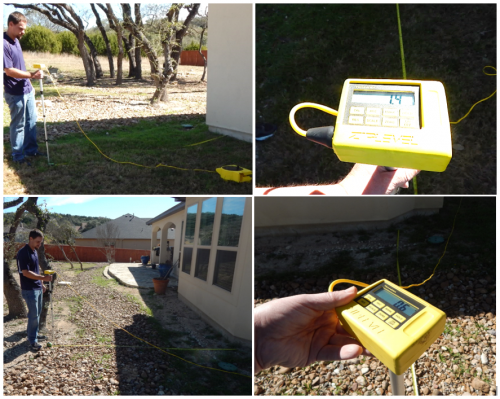 Center- The Zip Level Equipment shown at that San Antonio Home Inspection that included the Grading / Drainage Level Survey by JWK Inspections (shown at left). 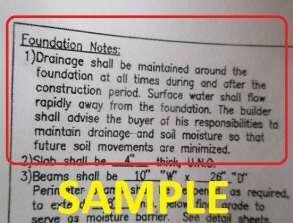 Readings were taken at 10' away from the foundation to evaluate needed drainage slope as as per requirements. The natural grade as seen at above center slopes from front to back. Even though it has that slope, it should first slope away from the foundation (which it doesn't) than drain down the natural slope See sample above right, of the grading slope first falling away from foundation than draining down the natural slope. Otherwise drainage runs down along the edge of the foundation and softens the soil and / or washes it away, which can lead to settling issues of the foundation & entire structure. away from the foundation in numerous areas as shown in this illlustration of a Drainage Level Survey. Below- A Drainage Slope Survey was performed at the driveway of that inspection. Zip Level Elevation readings showed inadequate draiange slope away from the foundation. 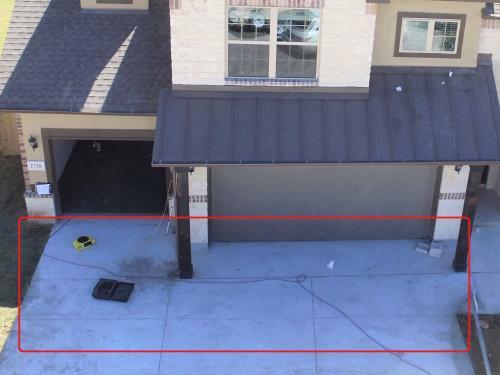 At right below, our drone view photo shows the area of the readings shown in the layout illustration at the left. that did not have adequate drainage slope as needed away from the foundation. foundations are common on homes in older neighborhoods around the San Antonio areas. 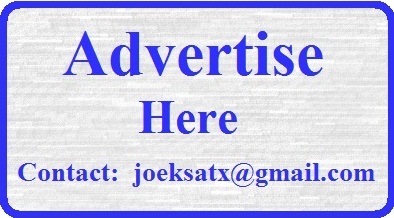 By Joseph W. Keresztury, JWK Inspections. 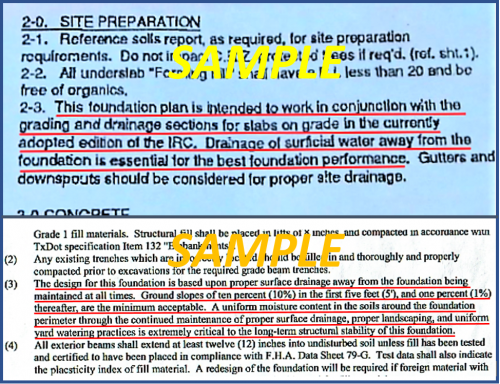 Engineers requirement images were from construction phase inspections (foundation pre pour) performed by JWK Inspections, including by GE Reaves, Galbraeth, Law, Westbrook Engineering & others in the San Antonio and South Texas areas.